Movies may be our first love here at Cinefessions, but we are proud dorks in the truest sense of the word. We love not only movies, but video games, books, comics, board games, men and women in spandex, and everything else that goes along with nerd culture. As longtime readers of graphic novels, comics, and trade paperback collections, we are excited to bring you a formal look at this genre in the form of criticism. 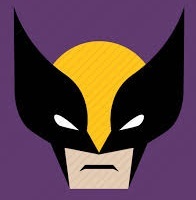 The Cinefessions team will use Graphic Novel Capsule Reviews to look at a single issue of a comic series, a collected trade paperback, or a stand-alone graphic novel, and review it based on five of the most important aspects of the medium. This allows us to discuss a comic or graphic novel clearly, decisively, and with brevity. These are not our full thoughts, just a highlighting of the major pros and/or cons. Big Trouble in Little China Volume 1 contains the first four issues in this direct sequel series to the 1986 John Carpenter film of the same name. Picking up at the exact moment the film ends, we find Jack driving his truck with a demon on the back. Turns out, because he defeated Lo Pan, this demon is now his to control as the ownership was passed to Jack. Things come to a head when another evil sorcerer decides he wants to resurrect his former master, kidnaps Wang, and forces Jack to enter another realm to hunt for three jars to exchange for Wang. It’s pretty much the typical plot devices when an author can’t come up with an original idea. Written by Eric Powell and John Carpenter himself, this sequel pretty much misses everything that made the original film a cult hit. I haven’t read Powell’s own series Goon, and I doubt I will after reading this. There are constantly jokes based on Wang’s name, which means there are at least three difference occurrences of the same joke. The characters almost feel like themselves, but now Jack Burton feels like Ash from Army of Darkness, and it just doesn’t fit for me. There’s also a noticeable lack of Gracie Law here. 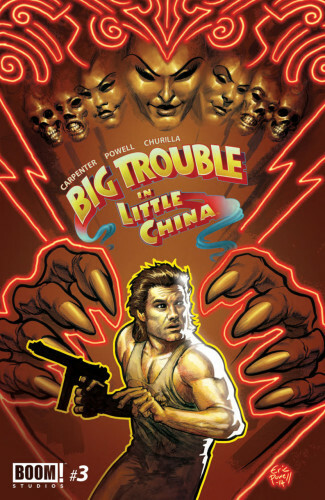 Brian Churilla, a name I didn’t know, but one I will be avoiding in the future, did the art of Big Trouble. This looks and feels like a bad knockoff of that Jackie Chan Adventures cartoon. The “action” is typically three panels that offer no real action at all. I think the “BAM!”, “POW!” action scenes from Batman showed off more action than this jilted structure. The art feels very much like caricatures of these movie icons instead of anything realistic, or worth seeing. While the film had a boatload of originality to it, this half-assed sequel falls back on typical plot devices. A quest for three items fill the majority of these four issues. In between, we get flashbacks to women Jack has dated previously, a vampire and a psychic. I’m not sure why this is even needed except to show that Jack has supernatural things drawn to him, but the vampire just seems stupid, and like this was the only way for the comics to have a female character involved, which is a shame. I was excited for this comic sequel but it’s so mediocre I don’t know why John Carpenter agreed to do it. It’s not like the Buffy the Vampire Slayer or Firefly continuations. I sadly bought this volume digitally because it’s sold out everywhere, most likely due to a low print run. That is the same reason I could never find the first three issues on shelves. If I had the chance to glance through this, I probably would have passed. I won’t be continuing this series unless someone is going to give it to me to read, or the library magically carries it. Please note that I read this on my Kindle Fire HD, and it does not feature a panel-by-panel view, and instead gives a weird, three panel view, which doesn’t work right with the way the strips are laid out in these issues.